LOVING HEART. 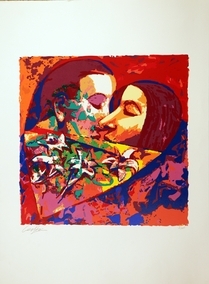 year: 2007 | technique: SERIGRAPH ON COTON PAPER | edition: Limited | PRINTED ON 300 gr. 100% COTTON PAPER ARCHES-RIVES. EDITION OF 50 | It is difficult to think of another artist like David Gerstein, whose work in recent years has gained such prominence on the local scene: his pieces are regularly exhibited at the Rosenfeld Gallery in the heart of Dizengoff, one of Tel Aviv's main streets; reproductions of his works have been published in all Israeli newspapers; some of his works have been chosen to appear on huge billboards, as human and aesthetic images that aim to catch the eye and engage the heart, and to promote companies like Isracard and the First International Bank; his monumental statues adorn Israeli cities; a playground of his invention continues to delight the children of Jerusalem; the Hebrew University ordered an ambitious and challenging project from Gerstein: the design of various statues which will symbolize - based on criteria of good taste, common sense and a high level of communication - the various University institutions and faculties; a television show has chosen to decorate its broadcasting studio with his works, in the hope that the pieces' tremendous popularity will attract viewers to the show; some of his paintings hang in the Israel Museum's collection and the Children's Wing of the museum exhibits his statues; and many more.